I usually bottle my kombucha after about 10 - 14 days. I've never taken a hydrometer reading to check the Gravity, but you could do a taste test, if you wanted some assurance. I don't — my kombucha has turned out consistently with a 10 - 14 day waiting period. Your kombucha might grow more sour the longer you let it sit, but in my experience, the level of sourness is more dependent upon how much sugar you add when you make a batch. And anyway, you'll be adding more sugar when you bottle it. I've talked to some people who just drink their kombucha straight from the jar, filling up a glass whenever they're in the mood, and eventually replacing what they consumed. If that works for you, then go right ahead — you've done all you need to do. Personally, I've never gotten comfortable with blatantly consuming SCOBY residue, even after all these months of drinking kombucha on an almost daily basis. Drinking straight from the fermenter weirds me out, and it seems a bit impractical, too. Bottling is the way to go — but in what? If you're already a homebrewer of some kind, glass works, although it has its risks. Homebrewers of beer carefully measure the progress of fermentation with a hydrometer so they know exactly how much sugar they can use to carbonate — excess sugar will cause excess carbonation, which possibly means exploding glass bottles. Not good. If you decide to use glass bottles anyway, please be careful, and use thicker champagne-grade bottles if you have them. For me, these 500 ml PET plastic bottles are perfect, other than being expensive. And since they're food-grade, high quality plastic that won't leech weird chemicals into your kombucha, you don't have to throw them out after one use — it's a one-time expense. I don't recommend using regular plastic bottles. Kombucha is highly acidic, and ordinary plastic bottles aren't meant for actually storing liquid more than once; they'd very likely pose a health risk over the long term. For the actual process of bottling, I recommend getting a second glass jar with a spigot. You can find them in various sizes at places like Target, or a home-goods store. This means you can pour your (fermented) kombucha into the bottling jar, refill your fermentation jar with fresh sugar-tea, and then bottle straight from the spigot. Granted, just pouring the kombucha works too, provided you have a funnel and a small enough container so that you don't risk dropping it and making a mess. (Unlike beer, oxidation isn't an issue. The conveniences never end!) Either way, a small funnel is a huge help here, and probably necessary for other parts of the process as well. The only thing you have left to decide, is: do you want your kombucha plain, or on fruit? In order to create carbonation in your bottled kombucha, you will need to give the yeast in each bottle something else to eat. When brewing beer, most homebrewers add plain old sugar at this stage. For whatever reason, this doesn't work with (my) kombucha. I really, really wish I could figure out why, but all my efforts and all my hours of research have uncovered no clues — plain sugar, when added to bottled kombucha, has never once produced any carbonation, in my experience. If you have any idea why this is the case, please, do let me know. Using whole fruit is a bit less precise, for obvious reasons, but I would aim for about 1/8th of a cup smashed-up fruit. You'll probably need something long and thin (and clean) to jam the fruit through the funnel. It helps if the fruit was frozen then defrosted, and therefore "soggy." Finally, when serving, I recommend pouring your kombucha through a small metal strainer, which will catch any fruit chunks, and also filter out the floating SCOBY colonies. 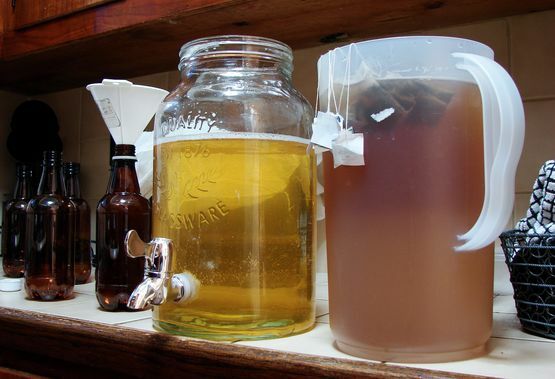 If you are skittish about floating bacteria chunks in your kombucha, this will save you a lot of misery. I highly recommend it. For a list of everything I've bottled kombucha with, as well as my thoughts on your best options, check out Part 4. Great article, how long does "bottle conditioning" take after you've added the fruit? I try to give it about 7 - 10 days before I start drinking the bottles, which usually isn't a problem... I have my bottling staggered so that it's often two or three weeks before I'm out of my previous batch and on to the newly-bottled one. is that a stainless steel spigot? No, I'm not entirely sure what the material is, but I realized I didn't quite trust it after I bought it. I no longer fill up the bottles through the spigot, I just use the jug to pour the kombucha through a funnel into the bottle. I could do it straight from the brewing vessel, but transferring first is a little less cumbersome (less heavy) and reduces the risk of accidentally dumping out a SCOBY.